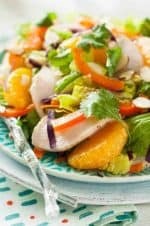 This Paleo Chinese chicken salad recipe is perfect for a nice warm spring or summer evening meal. It would also be good for lunch or any other occasion. I love how it’s light, but filling and a little sweet and crunchy. It is officially Spring here in Utah! The weather has been a little odd but – hey – it is like that every year. So we are excited to have more of a mild spring and summer ahead of us. This oriental chicken salad makes me excited for all of those nice warm nights. This is a delicious Paleo Chinese Chicken Salad Recipe. I make this main dish Paleo Chinese chicken salad really often for myself. It’s a good standby when you want something good, light, and easy. This salad can be great for a good meal for lunch or dinner. It can be made for one person or ten. I came up with the idea for this salad when I was supposed to bring one of those Ramen noodle salads to a potluck. The kind with cabbage, crushed dry Ramen noodles, an oil dressing and other stuff I can’t remember. I wasn’t about to eat that. I did make that for everyone else, but for me, I wanted something that actually tastes good and is good for me – and this ended up being so good that I regularly eat it now. Now I just need to convince my children to try it. 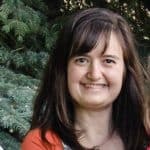 I haven’t had much luck getting my children to eat salads unless they are really unhealthy salads with tons of ranch dressing and croutons – and I’m not sure that counts. The flavors of the salad work really well together. I added sesame oil to the dressing for this salad to add a little extra Asian flair. I used orange bell peppers in the salad, but red or yellow would work just as well. The red onion could also be used in place of the green onions if desired. I have used both canned and fresh mandarin oranges in this recipe. In the post above, I used canned ones. Technically, they aren’t Paleo because of the sugar on them, but I drain and rinse them and figure that’s pretty close to Paleo. If you aren’t comfortable with that, just use fresh mandarin oranges or Halo oranges. Use cabbage instead of lettuce. Make it more like an Asian chicken salad by adding some coconut aminos as a soy sauce substitute to the salad dressing. Sometimes when I don’t want the carbs, I just make a simple dressing out of homemade mayo and a little light olive oil or avocado oil and vinegar. If you’re like me, I pretty much always have homemade mayo. on hand and use it like ranch dressing on lots of my Paleo salads. Try sprinkling some sesame seeds on top. This would be easy to meal prep by cooking the chicken ahead of time and preparing the salad dressing, then it would only take a few minutes to pull everything together. Do you find that you eat a lot of salads when eating Paleo and Clean Eating? I always feel like I’m losing weight when I eat salads like this. Maybe it’s just my imagination, but I figure it meets all the criteria for a weight loss salad since it is high in protein and low in carbs, other than the dressing. I added sesame oil to the dressing for this salad to add a little extra Asian flair. I used orange bell peppers in the salad, but red or yellow would work just as well. Red onion could also be used in place of the green onions, if desired. Preheat the oven to 350 degrees. Place the chicken in a baking dish and season with salt and pepper. Bake in preheated oven for 25-35 minutes, until done. Cook time will really depend on the size of your chicken breasts. They should be at an internal temperature of 165 degrees when done. Remove chicken from oven and lett cool completely. When the chicken is cool, cut into thin slices. 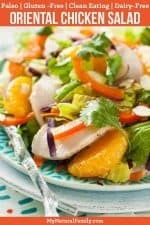 In a large bowl, add the lettuce, bell pepper, carrot, cabbage, mandarin oranges, onions, almonds and sliced chicken. Whisk the honey, vinegar, mayo, sesame oil, and salt together in a small bowl. Pour over the salad ingredients and toss everything together. This looks yummy! Definitely going on my list of salads to make! Thanks for sharing! This is a great summer time salad. Thanks. This sounds so yummmy – I like anything that combines chicken and nuts! I’M PRINTING THIS ONE!! SOUNDS AMAZING! !